If you're on the hunt for a compact, lightweight stroller—sometimes referred to as an "umbrella" stroller—we think the best is the Kolcraft Cloud Plus (available at Amazon for $59.99). Though it's more of a lightweight standard stroller than a true umbrella model, it is maneuverable, lightweight, costs less than $70 on sale, and yet has features we typically expect to see only on larger, more expensive models. How do we know it's the best? We've spent months researching every single stroller on the market—over 230 of them—and have tested more than 30 in person for things like maneuverability, ease of use, build quality, and to see how well they fold up and store when not in use. For lightweight and umbrella models, this means placing a particular emphasis on how well these things fold up and store. For most people, a lightweight model like this is a backup, or something you take on trips. None of the ones we tested hold a candle to our favorite stroller—the Baby Jogger City Mini—but they are ideal if you don't need a full-size model or just want a low-cost backup. I'm a parent of a little one, and I know sometimes you just need a way to get your kid from Point A to Point B. The models we tested are perfect for that. Most cost less than $100, weigh less than 15 lbs and fold down to a relatively compact size—or at least a long, narrow shape that's easy to store. There are exceptions, of course, but to find out about all the models we tested and which ones we think are the best, read on. The Kolcraft Cloud Plus is the best lightweight stroller we tested in this roundup. If you're in the market for a lightweight or umbrella stroller, we think the best is the Kolcraft Cloud Plus. In our testing we found it had the best all-around combination of size, build quality, maneuverability, cost, and features. It weighs less than 12 lbs, costs less than $70 on sale, and has features and storage space on par with larger, more expensive models. Unlike the other models we looked at, the Cloud Plus can quickly fold up with a single hand using the folding mechanism on the handlebar. It takes some practice, but it is a snap once you get it down. It's not a true "umbrella" model in that it doesn't fold into a long, skinny shape, but it is very compact when folded. It can even free-stand, something none of the umbrella models we looked at could do. Beyond that, the Cloud Plus excelled in our real-world testing. My favorite part was how accessible the storage basket was, making it easy to stash bags, blankets, and other gear. I was also impressed by how easy it was to push and maneuver around obstacles, and the fact that you get both a parent tray and a child tray is great for the price—many similar models don't include either. It's not quite as sturdy as the best full-size strollers, but this was easily the best lightweight model we looked at. Even if you're in the market for something closer to a "traditional" umbrella stroller, the Cloud Plus is worth checking out. If you need a double stroller, there's even a lightweight double stroller version of the Cloud with side-by-side seats, for just a bit more money. The Summer Infant 3Dlite is one of the most popular strollers on the market, and it's easy to see why: It costs around $50-60 on sale, it weighs just 12 lbs, it feels a bit nicer than most other strollers in the price range, and it has a good amount of storage. In our testing we found that it was highly maneuverable for an umbrella model, though its plastic wheels still struggled on rough or loose terrain. It does have a small wheelbase, though, making it easy to get in and around tight corners or cramped stores where larger strollers wouldn't fit. It did come in slightly behind the Kolcraft in our testing for a few reasons. It doesn't come with a child's tray, it's a little trickier to fold, the canopy isn't quite as nice, and the under-seat storage isn't as easy to access. It does fold into that traditional umbrella shape, but it's very long and actually can be tougher to store sometimes as a result. That said, it's lightweight, affordable, and of the hundreds of user reviews we've read, most are very positive. It's also especially good for taller parents (think 6'1" and up) who may have to bend over to reach smaller models. Sometimes you just want a cheap stroller. Retailing for between $20-25 at most stores, the Cosco Umbrella Stroller is by far the most affordable option we looked at, and it shows. It has the smallest wheels, the thinnest frame, and it doesn't have any extra storage, cup holders, or a child's tray. But for under $30, it has the basics: a seat, wheels, and the ability to fold up when not in use—all weighing in at just 8.4 lbs. While I wouldn't recommend this as anyone's everyday stroller due to the lack of storage, our research shows that most people buying an umbrella model often just want a low-cost backup. You could easily take this on a quick trip and have a backpack or something similar to carry your essentials. One thing to note: pricing on this model is all over the place. At most big box retailers you can find this for between $15 and $25, depending on the print. Models with a canopy usually cost about $5 more, but our review unit had one and was just $20 at Target. Anything under $30 is good in our book, but beware online resellers that will jack the price above that. My name is TJ Donegan and I'm the Executive Editor of Reviewed.com. I'm also a dad to two little ones, and I've been the lead editor in a number of our parenting guides, including our roundups of the best strollers, the best diaper pails, and the best bottle warmers. Of all the things we had to buy when my wife and I had our daughter, the stroller was the trickiest. There are just so many of them, and when you start considering adapters, infant car seats, bassinets, prams, whether you need a double for a second kid down the line—it just feels overwhelming, never mind that some strollers cost $50 while others go for well over $1,000. We put in months of research to find all the best strollers on the market. While it would've been easy to just check out a few popular models and call it a day, we put in months of research to find the best stroller on the market. We spoke to every major manufacturer, researched and compared over 230 models, and called in over 30 strollers for in-depth, hands-on testing across several different guides. For lightweight and umbrella strollers, our focus was primarily on finding models that were lightweight, compact, easy to fold, but still maneuverable. 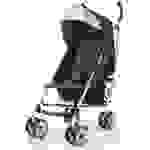 While many people opt for an umbrella stroller because they want something compact, it's still a stroller. Though some super-cheap umbrella models are great as a backup for a quick trip to a museum or the zoo, we wanted to find a well-rounded model that could still do it all. To pick our winners, we involved not only our in-house parents but other real-world parents as well. Testing consisted of unboxing and assembling every stroller, as well as rating them for things like build quality, maneuverability, weight, storage, and how easy they were to fold and unfold. For umbrella strollers, we paid special attention to how compact the models get when folded, which is critical when traveling. In the end, we found that the best lightweight and umbrella models work very much like larger, standard strollers. They fold up easily, they don't take up a ton of space, they don't get caught on little dips in the road and minor obstacles, and it's easy to get your kids and bags in and out without too much fuss. You may still want a second stroller. Umbrella models are great for travel or in a pinch, but they don't make great primary strollers for most people. The biggest reason is they typically do not accept infant car seats the way a standard stroller will, which means they aren't useful until your baby is closer to 6 or 7 months and can sit on their own safely. You can get around this by getting one of the few umbrella models that do accept infant car seats (and buying a compatible one), or picking up something like the Baby Trend Snap N Go which is a "caddy" that basically turns a compatible infant car seat into a stroller. Once your baby grows out of the infant car seat and can sit up safely, just use the lightweight model as normal. Umbrella models often lack storage. Though our top pick has some storage options available, umbrella models often have little or no storage at all. We note this for all models where it's relevant in this guide, but if you get one without enough storage you're going to have to gameplan what you do and don't bring with you. Umbrella strollers fold up more compactly. Our top pick for this guide is not exactly an umbrella model, because while it can fold flat vertically, the frame is rigid horizontally. This means it becomes long and flat, rather than long and skinny (like an umbrella). In reality, there's very little difference between the two. The Kolcraft Cloud Plus is just as light as most umbrella models, it has more storage, it's more maneuverable, it's much easier to fold, and it travels exceptionally well. Higher price does not necessarily mean higher quality. Though none of the lightweight models we tested were egregiously overpriced, there are still some big differences. Though the $30 and under models looked and felt cheap (because they are), there wasn't much difference between the $75 models and the $150 ones. Pretty much all of these models use plastic pieces, small wheels, and thin fabric seats without much backing—it's how they stay so light. As a result, once you get to the $50 range and up you shouldn't feel like you're getting a substantially better product just because it's more expensive. 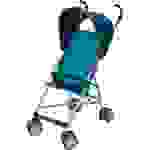 Standard stroller: This covers most strollers, and our top picks are found in our guide to the best strollers overall. They are average in size, typically weigh 20 lbs or more, and hold one child from about 6 months until he or she is about 50 lbs. 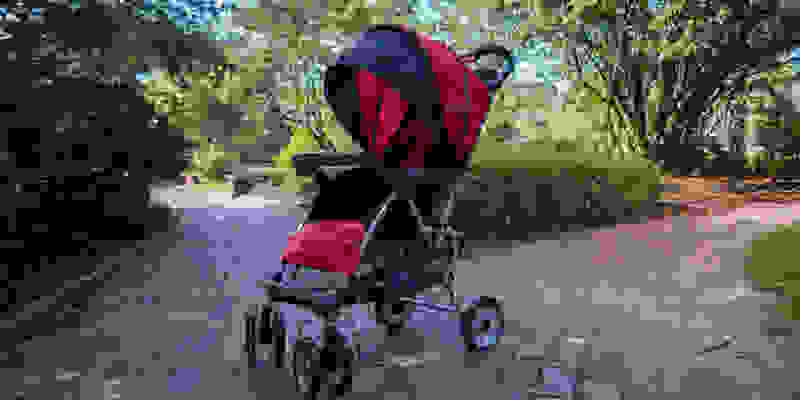 Lightweight/Umbrella stroller: Though new designs mean that many standard strollers are only barely heavier than these models, umbrella strollers typically weigh 15 lbs or less and fold up compactly into a long, narrow shape (like an umbrella). These models are great for travel, or if you have an older child who doesn't need a stroller all the time. All the models in this guide are umbrella/lightweight strollers. The Baby Jogger City Mini won our roundup of the best standard strollers, so we had high hopes for the City Tour, which is lighter and can fold down to an even more compact size. It performed well in our tests, but it costs around $170 on sale, which is still about $100 more than our top pick. The City Tour is not a traditional umbrella model, but it weighs just over 14 lbs and folds down a size and shape that we feel is actually better suited to travel. Like the City Mini it has a pull-to-fold handle on the seat, though you need to fold it a second time using a button on the handlebar to get it to its smallest size. When open, the City Tour is actually quite a bit sturdier than other lightweight models. The wheels are still smaller than a standard model, but the frame feels much less wobbly than your typical umbrella stroller. The canopy is also excellent, but like the City Mini you have to pay extra for a child's tray or a parent console/cupholder. The major issue, however, is the seat. User reviews on this model continuously called out the seat for being too shallow and sloped, meaning the center strap is often the only thing holding your child in place. My 15-month-old was fine, and the seat isn't shorter than the other umbrella models we looked at, but you may want to give this a shot in person before you commit, given the relatively high price tag. 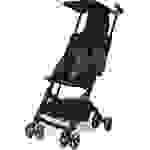 The gb Pockit is one of the most intriguing lightweight strollers on the market. It weighs less than 10 lbs, supports kids up to 50 lbs, and features a complex series of folding mechanisms that allow it to shrink down to an extremely small size—small enough you could easily carry it onto most flights. Once open, the gb Pockit works like any other lightweight model, with a relatively smooth ride and an excellent turning radius. 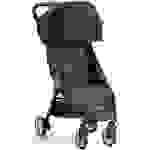 Like the other strollers in the class it also has small wheels, so it does well in cramped quarters but struggles with rough terrain and obstacles. It also has a skimpy canopy that doesn't provide much cover. Though it would be excellent for any frequent travelers who want something that can shrink to an exceptionally small size, it's expensive. Typically selling for just under $200, it's only worth it if you absolutely need a stroller that can get this small and weighs less than 10 lbs. If you can deal with a few more pounds, we recommend the Baby Jogger City Tour—assuming the seat isn't a dealbreaker. Not only does the Tour drop to around $170 on sale, but ithas a full-size canopy, large wheels, a reclining seat, a child's tray, cup holders for the parents, and it even accepts Graco ClickConnect infant car seats. I was very excited to see what the LiteRider could do, but it simply didn't live up to expectations. It had an unnecessarily obnoxious assembly process, the canopy never quite sat right, and the stroller was tough to fold correctly—and even when you get it right it isn't that compact. That said, the stroller is fairly maneuverable and has a very easily accessible storage basket. The padded seat is nicer than most of the other lightweight models we tested in this price range, and you do get both the child/parent trays in the price. The user reviews are good, though, so we don't expect many long-term issues despite the poor first impression. The fit and finish wasn't what I hoped for, but you can't argue with the value. Not only is the stroller affordable, but you can find it as a travel system (meaning it includes an infant car seat) online for just $100 on sale, which is among the cheapest options we've seen.